The Wednesday's OEF SPEED MANIA fest will introduce you the new blood, EVIL INVADERS from Belgium. Although very young yet very ferocious band estabilished in 2013, many shows and tours almost all over the whole world or signed under well-known Napalm Records. Their debut album called „Pulses of Pleasure“ released in 2015 made it also into the Belgian charts staying there for several weeks as the first speed/thrash metal band from Belgium. EVIL INVADERS are youngsters, but they will put us back into the time when metal was THE METAL. Bloody great live band, full of energy and aggression, this is EVIL INVADERS!!! 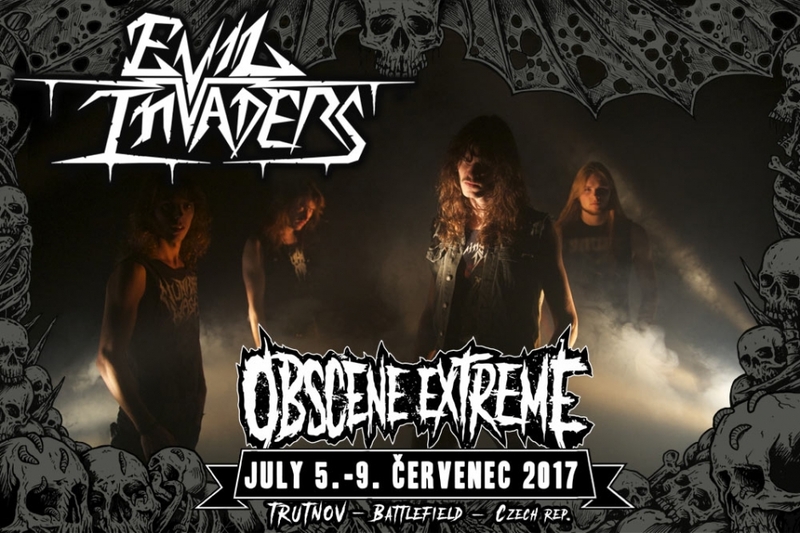 EVIL INVADERS play Speed-Thrash Metal who -despite their young age- are already touring and selling records nearly all over the world. Imagine bands like Metallica, Motorhead, Iron Maiden (on speed) or Exodus in the early 80’s but with a new and aggressive twist. Early 2015 EVIL INVADERS released their debut album and pulled over 1500 people to their release shows. These ferocious youngsters are the first Speed Metal band to date to hit the Belgian charts for several weeks. Speed/Thrash Metal might be considered to be a niche, however, EVIL INVADERS are bringing it all back in style and are even considered to be one of the most promising (extreme) Metal bands of the new generation. The band's live energy, aggression and virtuosity is -to say the least- impressive!